South of Rokugan lie the foul Shadowlands, the home of horrid demons and unnatural creatures. Centuries ago, the Crab Clan built the huge Kaiu Wall to contain these threats, but each day sees new assaults. Without samurai of courage and honour to defend against the threats of the Shadowlands, the Emerald Empire would surely fall. Shadowlands explores these dark realms and the tainted creatures that fester within, as well as the samurai who do battle against them at the Wall or beyond. 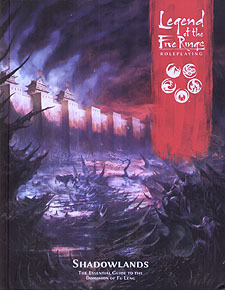 Tales of the Shadowlands and its many vile denizens and locations such as the festering Pit of Fu Leng, plus those of the Crab Clan, and the Kaiu Wall itself. Rules for the Falcon Minor Clan, plus new schools, weapons, techniques, and weapon patterns designed to thwart the evils of the Shadowlands. Players also gain new maho techniques, should they dare to use such forbidden blood magic rites to gain power. GM Support including tips for running Shadowlands-themed adventures, rules for generating unique, demonic oni, and guidance for using corruption in games.